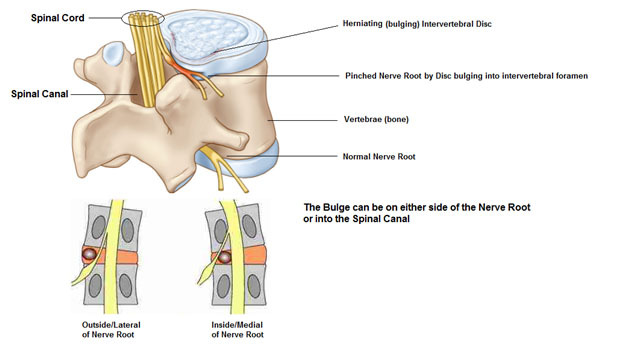 Sciatica is a set of symptoms including pain that may be caused by general compression or irritation of one of five spinal nerve roots that give rise to each sciatic nerve, or by compression or irritation of the left or right or both sciatic nerves. The pain is felt in the lower back, buttock, or various parts of the leg and foot. In addition to pain, which is sometimes severe, there may be numbness, muscular weakness, pins and needles or tingling and difficulty in moving or controlling the leg movement. Typically, the symptoms are only felt on one side of the body. Sciatica is a set of symptoms and needs a thorough diagnosis for what is irritating the root of the nerve, causing the pain. Treatment for sciatica or sciatic symptoms often differs, depending upon the underlying cause of the symptoms and pain levels. You may be asked for simple tests and MRI scan to reach diagnosis. Bed rest for Mild cases of Sciatica. Facet join injections, trigger joint injection and rarely surgery.